The mobile detection-assessment response system (MDARS) is a joint Army-Navy effort to field interior and exterior autonomous platforms for security and inventory-assessment functions at DOD warehouses and storage sites. The MDARS system, which provides an automated, robotic-security capability for storage yards, petroleum tank farms, rail yards, and arsenals, includes multiple supervised-autonomous platforms equipped with intrusion detection, barrier assessment, and inventory assessment subsystems commanded from an integrated control station. The DelFly Explorer is the first flapping-wing micro air vehicle that is able to fly with complete autonomy in unknown environments. Weighing just 20 g, it is equipped with a 4 g onboard, stereo-vision system. The DelFly Explorer can perform an autonomous take-off, maintain its height, and avoid obstacles for as long as its battery lasts (~9 min). All sensing and processing is performed onboard, so no human or offboard computer is in the loop. Video shows a quadcopter, acting as a running coach, flying ahead of a jogger. This chapter focuses on redundancy resolution schemes, i. e., the techniques for exploiting the redundant degrees of freedom in the solution of the inverse kinematics problem. This is obviously an issue of major relevance for motion planning and control purposes. In particular, task-oriented kinematics and the basic methods for its inversion at the velocity (first-order differential) level are first recalled, with a discussion of the main techniques for handling kinematic singularities. Next, different firstorder methods to solve kinematic redundancy are arranged in two main categories, namely those based on the optimization of suitable performance criteria and those relying on the augmentation of the task space. Redundancy resolution methods at the acceleration (second-order differential) level are then considered in order to take into account dynamics issues, e.g., torque minimization. Conditions under which a cyclic task motion results in a cyclic joint motion are also discussed; this is a major issue when a redundant manipulator is used to execute a repetitive task, e.g., in industrial applications. The use of kinematic redundancy for fault tolerance is analyzed in detail. Suggestions for further reading are given in a final section. This video shows some advanced inverse kinematics mapping that enables the control of a redundant manipulator (KUKA LWR) by means of Cartesian location and geometric correspondence to the human arm. Thereby the null-space of the robot manipulator can be exploited to enable very intuitive operations. Joint limits and singularities are avoided, as well, by optimized mounting of the robot and the hand. 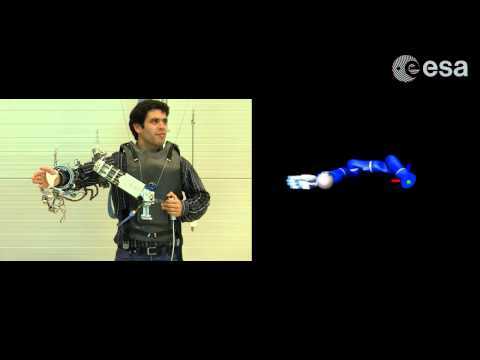 The video shows stages of evolution of bipedal walking in a simulated, bipedal robot using realistic physics (from the work by Torsten Reil and originating at Sussex University). 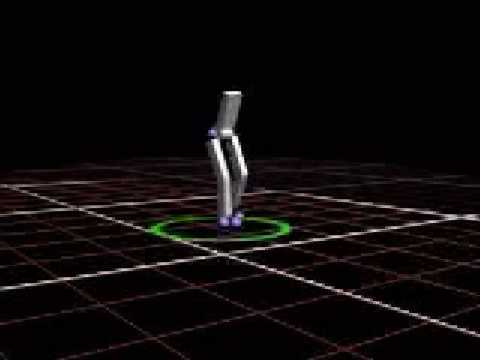 This was the first example of successfully- evolved bipedal gaits produced in a physics-engine-based simulation. The problem is inherently dynamically unstable, thus making it an interesting challenge. This video demonstrates the use of vertical and horizontal vibration of a supporting bar to cause the object on top to slide one way or the other. Upward acceleration of the bar increases the normal force, thereby increasing the tangential friction force during sliding. With periodic vibration, the object achieves a limit-cycle motion. By choosing the phasing of the vertical and horizontal vibration, the net motion during a limit cycle can be to the left or right. Video shown at 1/20 actual speed. This video is related to the example shown in Fig. 37.9 in Chap. 37.4.3 of the Springer Handbook of Robotics, 2nd ed (2016). In this video, a mobile robot helper referred to as Mr. Helper is proposed. Mr. Helper consists of two 7-DOF manipulators and an omni-directional mobile base. The omnidirectional mobile base is the VUTON mechanism. In this system, a human and Mr. Helper communicate with each other by intentional force. That is, a human manipulates an object by applying intentional force/torque to the object. We design an impedance controller for each manipulator, so that the object manipulated by both arms has a specified impedance around a specified compliance center. Refrence: ICRA 2000 Video Abstracts. This video shows reconfigurable robots, which are capable of a variety of configurations and modes of locomotion, including bipeds that can stand up and walk. This system is robust in a variety of situations, as shown in the video. The system has three clusters: when clusters disconnect, they enter a search mode and approach each other to assemble. After successful self-reassembling, the robot system stands up to continue its task.